Staging a bar area is a crucial consideration for any home that features a wet or dry bar already installed in a particular room. Although I would not recommend adding a bar as part of a home staging plan, enhancing an existing bar is vital, if the area is to become an asset instead of a potential liability. In-home bars are becoming more popular again, after reaching their height of residential placement in the 1960s and 1970s. Now, many families are once again realizing how useful a bar area can be for entertaining and adding ambiance to any home. This tutorial provides solid guidance on staging a home bar area in order to appeal to prospective buyers during the real estate sales process. Bars are usually built in an ideal room of the home, but some are in less auspicious areas. Bars will only be potential assets if they are located in logical, beautiful and useful locations. 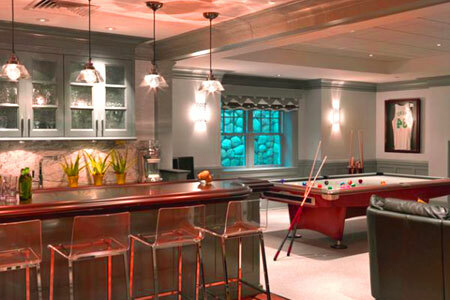 Bars are best placed in man caves, media rooms, finished basements, gamerooms and possibly in the great rooms of particular types of apartments that are marketed towards single urban professionals. Bars in other areas of the home should be demolished and discarded, since they are likely to be seen as liabilities and might even frighten buyers away. Bars are horrific when located in unfinished basements, in utility rooms, in garages or in the fundamental areas of the home, such as in a master bedroom suite. Remember, the surroundings of the rooms should be appropriate for entertaining, eating and drinking. If the immediate vicinity is not appealing, then do not invest any additional money in the bar, Instead, remove it and continue to improve the area as per the remaining staging plan. First, make sure that the bar itself is clean and beautiful. Wood bars may have to be sanded and refinished or simply stained again for a fresh appeal. Glass bars should be spotless and devoid of fingerprints or water marks. Be sure that all the stools and chairs are stable and upholstered in matching fabrics that complement the overall décor. Some bar-related art is great, but do not go crazy with neon signs or any type of artistic depiction or reference that might be construed as offensive, exclusionary or distasteful to prospective buyers. Think classic and classy lounge, rather than a drinker’s dive. If there are actual taps or liquor machines, be sure that everything works and is shined to perfection. Arrange bottles artistically and utilize lighting to add to the dramatic effect. Remember to keep lots of appropriate glassware in the bar to serve drinks at a moment’s notice. Be certain that every glass is shining clean and matches its intended drink application. Do not forget to have all the necessary bar tools displayed on hand. Once again, these should always be kept spotlessly clean and neat. A bar refrigerator is great and if available, it should contain all the needed garnishes to make a selection of drinks, including lemons, limes, fruits and simple syrups. This is also a great place to keep bottled beer, if no other dedicated storage is available. Wine should be kept in dedicated racks or refrigerated in a separate cooling unit. Bars only appeal to some adults and can potentially be viewed as contrary to a wholesome family environment. Always carefully consider the target buyer demographic when deciding whether to leave a bar in place or whether to remove it. If the bar fits the home and is perfectly located in an appropriate room, then it can surely be marketed as a real gem. However, when these ideal circumstances do not apply, then the bar should be discarded. The final word of advice about home staging a bar is to objectively imagine how a conservative potential buyer will see the fixture and then plan accordingly. When decorated, any home bar should personify the type of lounge environment found in a fine hotel. Think high-end, stylish and timelessly cool. Home bars should not resemble your local drinking hole and should certainly not present this image to an interested buyer. When staged correctly, a bar can help any seller to share the warmth of their house with perspective buyers and easily convince them that destiny intended this to become their next home.